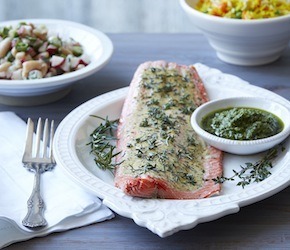 Wild-caught sockeye salmon is certified sustainable by SeaChoice, Ocean Wise and the Marine Stewardship Council. While there are some concerns about spawning returns and habitat degradation, Pacific sockeye is one of the world’s most intensively managed and studied fisheries. For now, it remains a better choice than salmon farmed in net pens. Preheat broiler on high. Place salmon skin-side down on a cookie sheet lined with foil. (You can thank me for that tip later). Season salmon with salt and pepper. Mash garlic to a paste using the flat side of your knife. In small mixing bowl, combine garlic, wine, oil, Dijon and grainy mustard. Broil salmon on the middle rack for 5 minutes and remove from oven. Apply glaze evenly, sprinkle with rosemary and thyme and broil salmon until the thickest part of the filet is firm to the touch, about 5 to 10 minutes. To add another dimension of flavour, place the salmon on a soaked cedar plank and bake on high heat on your outdoor barbeque grill with the lid down until firm to the touch. * To remove pin bones from a salmon filet: Lay the salmon skin side down and run your fingertips along the thickest part of the filet to find the tips of the pin bones. Use a pair of clean needlenose pliers to grasp the end of the bone and pull gently in the direction the bone is pointing, about 45° toward the thick end of the filet. I keep a set of pliers around strictly for kitchen jobs. Don’t use the pliers in your tool kit. Randy Shore is the author of Grow The Food You Eat, Eat the Food Your Grow. Click here for a blog post review of this cookbook!